A thriving community of pirate fans has turned foul-mouthed, rum-fueled revelry into a lifestyle. Not satisfied with piratey puns or bad jokes about the "poopdeck," these people express themselves through cosplay - the fan-centric practice of dressing up as fictional characters - and take great pride in their imaginative creations. "The most fun I have is when I'm a pirate, because you can drink and carry on and act out and stagger, and guys will throw their girls at you to take a picture," said Robert Bean, a master technician for Toyota by day and "Pirate Cutthroat Robert" - "Pirate Bob" for short - at festivals, conventions, parades and pirate events. "For me it's a lot of fun. It's like a mask, you get to act out behind it. You get to be someone you're not or you get to embellish the characteristics you have in yourself. As a pirate you can go in and create your own character. Get yourself a hat, some boots, a sword and a gun and you're there," he said. Andrew Duncan, a graphic designer who cosplays as "Captain Drew," a space pirate, said pirate personas offer fans a way to regain some control of their surroundings. "All the people I've met through the world of piracy, they're just frustrated with modern life," he said. "But this is something they can do [to escape technology]. They put on some old clothes, they drink a lot of rum, they sing songs, they go down to the ocean. I think it's the new agrarian movement, only it involves piracy," said Duncan. "It's about freedom and expression and a little edge of adventure and danger," said Finch. Pirate cosplay allows people to escape the banality of work-a-day life, he said. "You've got to try to break away and give yourself some adventure. Your mind craves adventure. At least people who are creative crave adventure," he said. And don't forget the attention. "Girls seem to love us. I get called 'Johnny Depp' about 20 times a day at a festival, and I don't actually look like Johnny Depp. There's something about the character he created that people who don't dress as pirates are attracted to, and people who do dress as pirates enjoy that attention," said Bean. But there are less glamorous aspects of pirate cosplay. "You look like a hooligan," said Finch. "Because I do "Jack Sparrow," I grow my beard out, with the braids. On a normal day when I'm not portraying the pirate character, I kinda look like a Harley guy, because of the beard. But, I'm really not." "One of the things that people don't realize - that movies don't portray - is that pirates are the scum of the earth," said Bean, who runs the historically focused League of the Black Flag cosplay organization. "They killed people. They didn't play around, they took what they wanted and they killed people and they threw them over the side of the boat. They were forced into that situation, because of the wars that were going on," he said. Bean said men would be forced into the navies of world powers to fight at sea, and when the wars were over the men were unceremoniously dumped back into their towns. With no job and only seafaring skills, "The fastest way to make money was to find another ship with passengers and gold and merchandise on it, and they would just go rob it," said Bean. Another reason pirates roamed the seas, said Bean, was because they were hired by countries at war to wreak havoc. Since communication was slow, said Bean, it could take months to let a crew of pirates know that the war was over and they should stop destroying ships and looting. 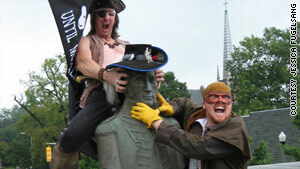 "Pirate Bob," left, and "Captain Drew" let Commodore Decatur know how they feel about his anti-pirate activities. "Talk Like a Pirate Day" isn't an important holiday for pirate cosplayers, said Duncan, who pointed out that they talk like pirates all the time. "And it's kind of like the original amateur hour, because all you hear on 'Talk Like a Pirate Day' is people saying 'Aaaarrrrr,' and telling all the pirate jokes you've heard a hundred times. I think a lot of pirates go hide on 'Talk Like a Pirate Day.'" To commemorate the holiday, "Captain Drew" hopes pirate cosplayers will join him at the sixth annual "Official PiratePalooza Pubcrawl & Pubsing." The event Duncan hosts draws as many as 200 pirate fans, decked out in their finest pirate regalia, to Decatur, Georgia, (the city was named for Commodore Stephen Decatur, an American naval hero who fought pirates in the second Barbary War) for a night of rum drinking and singing sea songs. "After the first year [of PiratePalooza] I was talking to the bartenders at the Brick Store, and one of them was complaining that someone tipped him in plastic doubloons, and I realized that was probably me. So, I tipped him a lot that night," said Duncan. • Slavey! Fetch me a jar! • Boy, bring us round a pot o' yer most affordable whisky! • Alesman, me cup be dry as an old woman's slipper! • Lass, there be two bits in it for you if me jar always be foamy. • Please to put a splash of the old Jack rum in this old salt dog's gill cup? • Lass, the perambulations of your bustle reminds me of the east Indie sea afore a strong gale. • You smell as ripe and bright as the moonlit sea... now let me inside your infernal corsetry, wench! • Do you come to this boozy ken often or are you just mad with the heat? • You look tired lass, best take my knee until you catch your wind. Has anyone ever told you you've lovely great sails? Hi there, I found your blog by means of Google while looking for a related topic, your site got here up, it appears good. I've bookmarked to favourites|added to my bookmarks. Too many of us grew up watching Robert Newton playing Long John Silver (Arrrh, Jim, me lad. Let's see what the Squire needs.) to not say "Arrrrh". But wait? What is a Pirate? According to the English Government, as long as William Kidd preyed on French and Spanish shipping, he was a Privateer. However, once England was at peace with Holland and he attacked a Dutch vessel, he became a Pirate. Of course, according to France and Spain, he was always a Pirate! As for Buccaneers? Well, look at the etymology – Bucca was an old Italian term for beef. These guys were the ones who shipped cattle and other livestock. Now, what do you suppose they did when they offloaded the cattle in the new world and got short changed by the local governor? You guessed it – they started raiding shipping. After all, they had good sized ships, empty holds (except for ballast) and a ready crew. Of course, if it wasn't for a specific group of Pirates, America would probably have lost significant territory back to England. The Pirates in question were the Baratarians of Jean Lafitte who provisioned Andrew Jackson with cannon, gunpowder and trained gunners at New Orleans in 1815. Woah this weblog is magnificent i really like reading your posts. Stay up the great paintings! You know, a lot of persons are hunting around for this information, you can help them greatly. This comes with the most perfect timing. I, having just "read" Robinson Crusoe (with my ears, as I am wont to do, being as I am dyslexic), I say, I am well enough versed in the King's English to partake in such a celebration of privateer parlance!